TLA » With our unique digital sales promotions you won’t struggle to reach the youth! The UK’s young adult population – those aged in their late teens to mid 20s – are savvy consumers to whom online and social media are second nature, which is why so many brands are using digital media in an attempt to reach them. However, exclusive polling conducted by market research agency ICM on behalf of Promotional Marketing magazine has shown that traditional media is still most likely to generate a response from the 18-24 year old market. In fact, young adults are slightly more likely to buy a product or service after seeing a promotion advertised on TV than the general population (28% of respondents aged 18-24 compared with 27% of all consumers). But it is posters and radio that really deliver more impact with this age group: 10% of 18-24 year olds responded to a promotion advertised on a poster, compared to the UK average of 6%, while 5% responded to a radio ad, compared with the average of 3%. 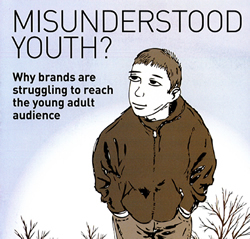 It is certainly true that some digital channels have a disproportionate impact with young adults. While the 7% who respond to promotions on social networking sites may not seem high, it is more than twice the UK average (3%). Similarly, the 3% of young adults who respond to material sent to their mobile phones is 50% higher than the national average of 2%. But not all digital channels deliver the youth market: email, for example, only works on 18% of 18-24 year olds, compared with the average of 24%. The research also highlights a real difference in behaviour between 18-24 year olds and the next age group up, 25-34 year olds (see table). The latter are a lot more likely to respond to promotions in general, but particularly those using direct mail, email, couponing websites and brand’s own websites. Nathan Bartlett, head of retail at ICM, comments: “The data seems to be reaffirming the belief that 18-24 year olds are a difficult group to target. The youth market is made up of “highly active consumers, particularly in areas like entertainment, snack foods, technology, fashion, travel, cosmetics and healthcare,” observes Luke Mitchell, managing partner of the youth and student marketing consultancy, Reach Students. Nathan Bartlett also points out that while some young adults do react to some traditional media approach, the research results may be skewed because promotional activity through newer media channels may not always be recognised as such. “The channel itself could reduce the feeling that it is direct selling,” he says. Engagement via social media is increasingly being used. Last month, research agency Conquest released a report into the social media habits of 16-24 year olds. It found that over a third of respondents said they have become a fan of at least one brand, product or company on Facebook. Layfield continues: “Our ethos is ‘only the market gets the market’.” The Conquest research found that 91% of 16-24 year olds check their Facebook accounts over six times a day, with 30% on the site for over an hour a time.